Not the best quesadilla recipe I've tried, but the garlic and cheese make up for it! 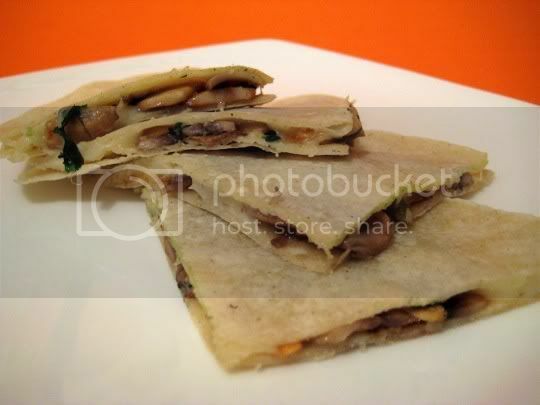 A simple mixture of toasted pumpkin seeds, caramelized garlic, cilantro, and sauteed mushrooms is the base for this quesadilla, which is housed between two corn tortillas and melted Monterey Jack. Although the recipe does not suggest it, I would salt and pepper the mushroom mixture to taste...this will better enhance the flavor of the mushrooms. The pumpkin seeds (which I would say are optional, as they don't add much flavor) add a nice crunch, and the garlic (which is slow cooked) is chewy and very pungent. If you like garlic, this will be your savior for the recipe. Make again? Maybe. Something is missing from this recipe, and it could be as simple as some salt and pepper seasoning.